A card game for the whole family. Easy to learn, mischievous, and beautifully illustrated! A life filled with a variety of activities is very pleasant. But careful, some situations imply more risks than others. 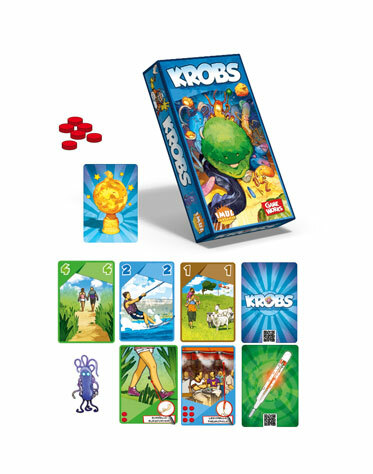 The game KROBS was developped at the Institute of Microbiology of the University of Lausanne in collaboration with GameWorks. It is edited by GameWorks and distributed by JeuPRO. The illustrations are by Vincent Dutrait. Price: 30 CHF per game, VAT included for Switzerland. The delivery costs are invoiced in addition and amount to: 7 CHF for Switzerland, 9 CHF for Europe and 15 CHF for the rest of the world. Customs duties in the country of destination are the responsibility of the customer. We usually deliver by mail within 3 to 10 business days. JeuPRO does not deliver to post office boxes.